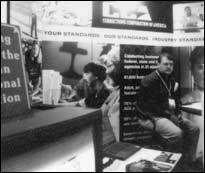 The Corrections Corporation of America booth, with its black and yellow logo, has a prominent place at the American Correctional Association trade show. CCA's Vice President of Customer Relations, James Ball, says CCA does not take an active role in writing or promoting ALEC's model sentencing bills. "You don't see CCA advocating for longer sentences; that's not true. If government, through its elected representatives, identified that, well, we are going to need to provide for public safety by incarcerating individuals  that is not a vendor-driven issue," Ball says. Asked if giving money and time to the American Legislative Exchange Council doesn't constitute support for tough sentencing policies, Ball says ALEC is just a research group and doesn't drive public policy. In fact, ALEC's stated mission is to drive public policy. The former Wisconsin Corrections Administrator, Walter Dickey, says he paid close attention to the debate over truth-in-sentencing in Madison. "There was never any mention that ALEC or anybody else had any involvement" in the crafting of the bill, Dickey says. The public debate over criminal justice policy  how to make the streets safe, what it means for the punishment to fit the crime  is an especially profound one, Dickey argues, in which profit has no place. "As I used to tell the troops when I worked in corrections, we lock the door, we deny people autonomy and freedom, the most cherished things in American life. I've always understood political people as having differences of opinion  tough on crime, soft on crime. But I've usually thought that whatever views were being held in that debate, they were sincerely arrived at. And to discover that there's a group pushing criminal justice policy not because it's in the public interest, but because it's a way to make money, is disappointing to me."